A Kildare man who was doing an internship at Vatican Radio was delighted to meet Pope Francis last week. Vatican Radio’s English Section’s intern, Michael Gannon, along with his family who flew to Rome for the occasion, met the Pope in St Peter’s Square. “I was very happy and felt really emotional. I knew that I am very lucky person to get an opportunity like this to happen for my parents and myself,” he recalled later in a broadcast on Vatican Radio. Michael Gannon and Vatican Radio, have made history with this internship. When Michael Gannon met the Director of Vatican Radio’s English section, Sean-Patrick Lovett, last May he suggested an internship at the radio. The “Think Different, Think Europe” conference was associated with the Europe for Citizenship programme for the EU, and brought together citizens from different EU countries who have Down Syndrome. 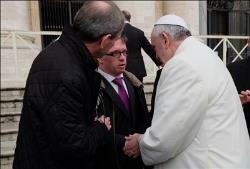 Consequently Michael Gannon became the first person with Down Syndrome to do an internship at any Vatican office. The meeting with the Pope at the conclusion of his internship period was the highlight of his time at the Vatican. He also interviewed several Vatican officials and attended a Serie A football match. During his first broadcast he introduced himself as a Kilkenny hurling supporter and Kildare football fan as well as a Manchester United supporter. He said he was looking forward to making friends, working in a team and to showing people what he is capable of doing. One of the broadcast interviews he did was with fellow Irishman Monsignor Paul Tighe, the Secretary of the Pontifical Council for Social Communications in Rome. “I asked him questions about himself and his work, and why he decided to become a priest. I also asked him if his Council presents the Pope’s messages for people with down syndrome in easy to read format,” he said. Michael Gannon is 33 years of age and comes from Newbridge in Co Kildare. 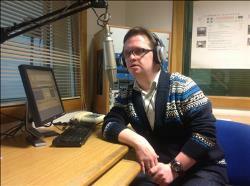 He works as an ambassador with Down Syndrome Ireland and is a media student.